Above Right: Returning after a successful hunting trip. Above: Athens, 1956. A photograph taken before I migrated to Australia. I am standing, in the centre. wearing white shirt. Above Right: Dancing with Grigorios Kapatos. 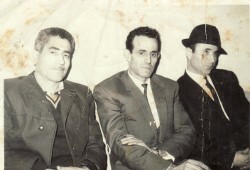 Above: With Georgios Loupis (left) and Vasilis (right).